Developer Bohemia Interactive celebrates its 15-year anniversary this month, having been founded in May 1999. To celebrate, it's discounting the prices of many of its games on Steam, giving away the first game it developed, and allowing gamers to play one of its most recent titles for free for the next few days. 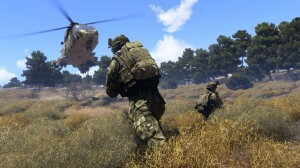 From now until May 18, Steam users can download and play Arma 3 for free. The open-world shooter was released as an Early Access game last year before being officially released in September. Since then, the game has received a great deal of free downloadable content, as well as a wide variety of fan-made mods that can be accessed through the Steam Workshop. Bohemia announced earlier this month that a "major" expansion is in the works and will be out in late 2015. Should Arma 3 not be of interest to you, or if you're simply looking for something to last longer than the weekend, Bohemia is giving away the first game it ever developed, Arma: Cold War Assault, for free through Steam. When it was released back in 2001, it was known as Operation Flashpoint: Cold War Crisis; after a 2011 re-release, it assumed the Cold War Assault name. Bohemia has also knocked down the prices of many of its games on Steam, including its Early Access games, which it doesn't ordinarily do. The standalone version of DayZ can currently be had for $25.49 (15% off the regular $30 price), while Arma 3's price has dropped to $35.99 (down from $60). The full list of deals can be found on the Steam sale page. Lastly, Bohemia is allowing anyone who has bought a non-Steam version of Arma 2 or its expansions in the past to redeem their CD keys on Steam in order to gain access to the respective Steam versions. "I’d like to thank everyone who has contributed in any way to the amazing 15 years at Bohemia Interactive," said Bohemia CEO and co-founder Marek Spanel. "The journey so far has been exciting, often challenging, sometimes hard - but, ultimately, always rewarding. While the games industry has fundamentally changed since the early years, our community continues to stand at the heart of everything we do, and together we will continue to create incredible games."